Asphalt additives are materials added to asphalt to alter properties of the asphalt binder. The addition of additives to asphalt increases the functional temperature range of asphalt. Furthermore, additives also prevent cracking by strengthening the bond between the binder and the aggregate. Additives also improve the film thickness of asphalt, thereby preventing cracking, unraveling, and deformation. There are several different types of additives use for asphalt modification with the most important being polymer modifiers, adhesion promoters, anti-stripping agents and phosphoric acid .Polymer additives are classified into two types- elastomers and plastomers. Elastomers increase the ductility, tensile strength, strain recovery and cohesion properties of the asphalt properties. Styrene Butadiene Styrene (SBS) and Styrene Butadiene Rubber (SBR) are the leading types of elastomers that are used for asphalt modification. Polyolefins based additives are the major plastomers incorporated into asphalt and increase the low strain tensile strength, modulus and operating temperature range of the asphalt mix. The global asphalt additives market was valued at US$3.3 bn in 2016 and is likely to rise to US$4.7 bn by 2025, exhibiting a steady 3.8% CAGR by volume. Hot mix asphalt (HMA) is manufactured by combining approximately 95% of aggregate (stones, gravel, sand) with 5% of asphalt binder in a HMA facility at 150°C to 175°C. Hot mix asphalt is the most widely used asphalt type across the world, due to its flexibility and resistance to weather conditions and water. Warm mix asphalt (WMA) is manufactured at temperatures between 90°C and 120°C and involves the use of additional binding materials and additives including emulsions and zeolites for easier pouring and spreading at low temperatures. Warm mix asphalt is more eco-friendly and less costly than hot mix asphalt. Usage of additives in asphalt is increasing substantially especially due to the increasing popularity of warm mix asphalt technology. Cold mix asphalt (CMA) is produced by emulsifying the asphalt in water with surfactants, prior to mixing it with the aggregate. The emulsified asphalt mixture is easy to work with and compact in nature due to its lower viscosity. The asphalt sets as soon as enough water evaporates and the emulsion breaks. Asphalt is the most extensively used road construction and paving material, followed by concrete. Asphalt roads and pavements are known for their durability and resilience. Asphalt road construction projects can be completed in a shorter time as compared to other materials. Apart from this, asphalt is also commonly used as a waterproofing material for roofing applications. Common asphalt roofing products include asphalt shingles, bitumen modified membranes, built-up asphalt roofing, and asphalt roll roofing. Other applications of asphalt include railway beds, airport runways, playgrounds, running tracks, tennis courts, barn floors, greenhouse floors, ports, bridges, and landfill caps. 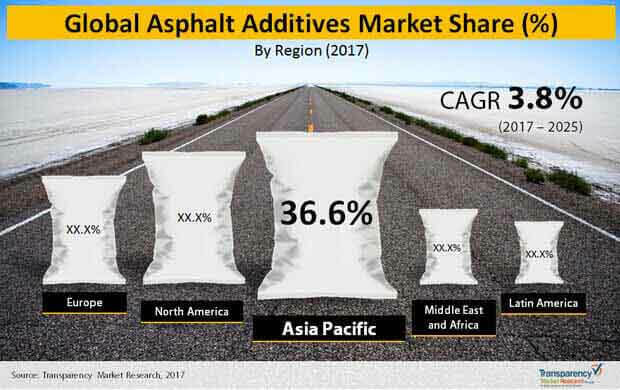 In terms of demand, Asia Pacific held the largest market for asphalt additives, with over 32% share in global figures in 2016. China, Japan, and India are expected to dominate the demand for asphalt additives in Asia Pacific. North America constituted the second largest market for asphalt additives in 2016. Increasing road building and construction activities in the U.S. are anticipated to drive demand for asphalt additives in North America. Meanwhile, stringent environment laws in Europe are expected to encourage the use of warm mix asphalt and, in turn, drive the demand from the asphalt additives market. Large road construction projects in GCC countries are also likely to drive the demand for asphalt additives in the Middle East. Other important consumers of asphalt additives are Mexico, Brazil, and South Africa. Key players in the global asphalt additives market are ArrMaz, Akzo Nobel N.V., Kraton Corporation, Kao Corporation, Honeywell International Inc., Evonik Industries AG, E. I. du Pont de Nemours and Company, The Dow Chemical Company, Berkshire Engineering Supplies, Huntsman Corporation, Ceca Chemicals, and Engineered Additives, LLC.